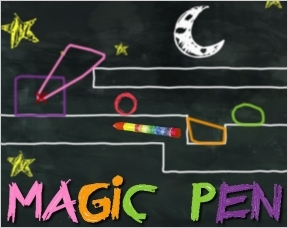 His take on the concept is a little flash game called Magic Pen. It features roughly the same type of gameplay (as well as some of the levels lifted directly from Purho’s game,) with a more highly-polished interface, and some of the ideas last spotted in the C.P.D. video brought to fruition (pivots, other shapes, etc.) through over two dozen levels. *Many thanks go out to the lovely and talented Juannah who brought this to my attention. She has a great blog, which YOU should go check out.